Borla builds their exhaust systems from 100% T-304 aircraft quality stainless steel, not mild steel, not aluminum, not coated aluminum. While coating sub-standard materials like mild steel may prolong life, these coatings suffer and typically fail at the weld points. Stainless steel maintains true to form and function at all points for superior corrosion protection. As the guys at Borla say, ''When you compare coated materials to 100% T-304 stainless steel, it's like comparing gold plated metal to solid gold!'' Worth Its Weight In Gold... Borla's world-class build quality and performance gains are considered by many to be an outstanding investment. And Borla's One Million Mile Warranty is proof that they take their products very seriously. Cat-Back Systems include the connection pipe(s), muffler(s), tip(s) and necessary mounting hardware. 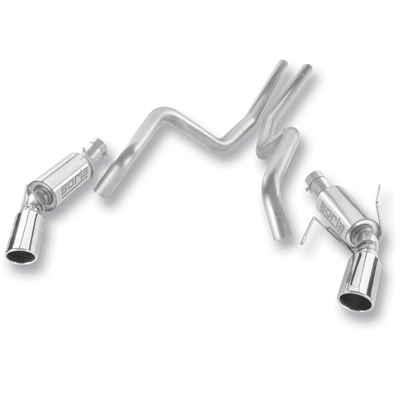 Rear Section Kits contain muffler(s),tip(s) and necessary mounting hardware. **$9.99 Shipping Rate Does NOT Apply to this item** No one else gives you the bold clean styling of our Aftermarket Dress Ups, Suspension and Performance Parts for your American Muscle Car like UPR Products! Fits these Vehicles: 2010 GT Shelby GT500 Shelby GT500KR V8 Mustang Roush & Saleen Vehicles.